Unusual seed potatoes will be available to buy at the Coupar Angus event. Potato enthusiasts from across the country are expected to converge in Coupar Angus on Saturday for the first Strathmore Tattie Day. 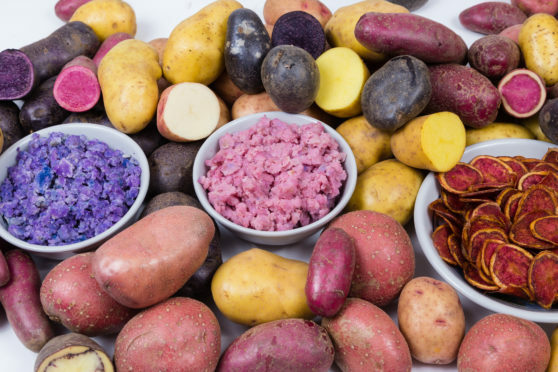 Around 30 rare and heritage seed tatties will be available from specialist producer, Andrew Skea of Skea Organics at East Mains Farm, Dundee and growers will be free to swap varieties with other growers and gardeners. A highlight of the day will be a “tattie talk” by local expert John Marshall who will describe his latest travels in Peru to learn more about the origins of the European potato. The event is part of the ABC and Beyond initiative led by Forward Coupar Angus whose aim is to connect food producers, growers and consumers. Funding from the Climate Challenge Fund has been used to boost the town’s community growing project which includes a market garden on a disused piece of land in the town. Project leader Amandla Taylor says one aim is for produce grown in the garden to be sold in the community shop. Other projects include an adopt-a-bed scheme for local people to take over cultivating a raised bed. Everyone is being encouraged to bring their own bags to the tattie day in order to reduce waste. The event, which takes place at the Coupar Angus Cycling Hub on Forfar Road, runs from 1-4pm and is free.